How do I troubleshoot unhealthy Application Load Balancer health checks in Amazon ECS? An Application Load Balancer health check for an Amazon Elastic Compute Cloud (Amazon EC2) instance in Amazon Elastic Container Service (Amazon ECS) is returning an unhealthy status. How can I make the Amazon EC2 instance pass the health check? The application in your Amazon ECS container returns the correct response code. The security groups attached to your load balancer and container instance are correctly configured. The advanced health check settings of your target group are correctly configured. When the load balancer sends an HTTP GET request to the health check path, the application in your Amazon ECS container should return the default 200 OK response code. Note: If you use an Application Load Balancer, you can update the Matcher setting to a response code other than 200. For more information, see Health Checks for Your Target Groups. 1. Connect to the container instance using SSH. 2. (Optional) Install curl with the command appropriate for your system. Note: The port for the local listener will appear in the command output under PORTS, at the end of the sequence after the arrow bracket. Note: The IP address of the container is saved to IPADDR. Note: The command should return 200 OK. If you receive a non-HTTP error message, then your application is not listening to HTTP traffic. If you receive an HTTP status code different from what you specified in the Matcher setting, then your application is listening but not returning a status code for a healthy target. As a best practice, configure one security group for your load balancer and another security group for your container instance. By following this best practice, you will allow all traffic between your load balancers and container instances. You will also enable your container instances to accept traffic on the ephemeral port range that is used for dynamic host port mapping. 1. Confirm that the security group associated with your load balancer allows all egress traffic to the security group associated with your container instance. Important: If you declare the host port in your task definition, the service will be exposed on the specified port rather than in the ephemeral port range. For this reason, be sure that your security group reflects the specified host port instead of the ephemeral port range. To check the security group associated with your load balancer, see Security Groups for Your Application Load Balancer. 1. 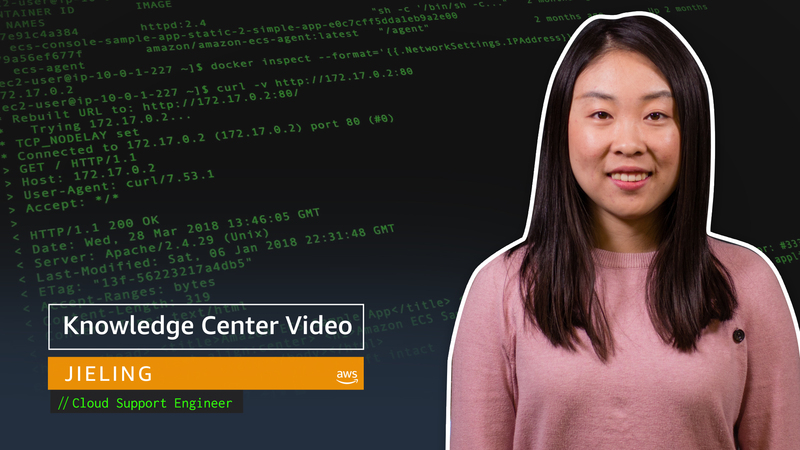 Open the Amazon EC2 console, choose Target Groups, and then choose your target group. Important: Be sure to use a new target group. Avoid adding targets to the target group manually because Amazon ECS automatically registers and de-registers containers with the target group. 2. Choose the Health checks view. 3. For Port, choose traffic port. Note: If you choose Override, health check traffic won't be routed correctly.